Wow, round 10 already; it seems like we only started doing this the other week, whilst paradoxically also feeling like Devon Record Club has been around forever. Intriguingly, my choice this week evokes a similar musical sense of eternal repetition and perpetual change and newness. 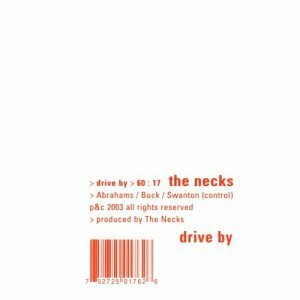 Drive By by The Necks, like the Rita Lee album I chose last time around, was a record that struck me as being perfect for DRC back when Rob first mooted the idea, even if it does contravene etiquette by being 17 seconds longer than the allotted 60-minute running time in our rule book. I first came across it, and them, in January 2004, when an article in The Guardian intrigued me. The Necks are a 3-piece “improvisational trance jazz” group from Australia, who occupy a bizarre and, as far as I can discern, unique landscape somewhere between ambient music, jazz, minimalism, modern classical, and a whole host of other things. They’ve been together for more than 20 years, releasing over a dozen records. Almost all of those albums consist of a single, hour-long improvisation, some recorded entirely live, others with overdubs added later. As with many artists, my first exposure to The Necks remains my favourite; I own another 5 albums by them in addition to Drive By, all slightly different, all very similar, all very, very good indeed, but Drive By is the one I go back to most often; and I go back to it a lot. If I could scrobble my CD players, I’m pretty confident that I’d have played this record more than any other single album in the last 7 years. When I worked in the film & music department in the library, and we played music for our patrons, this was the record that garnered the most comments – from students to shelvers, it seemed to intrigue and beguile everyone who heard it. Which is fascinating, because the very nature of what The Necks do makes their music incredibly hard to discover; you won’t hear them on the radio, or find them on YouTube, and any 30-second snippet of their music you might preview on iTunes would make no sense, because what they do needs to be consumed whole, whether you’re paying full attention to it or just embracing its utility as background noise. The Necks perfectly fit Eno’s description of ambient music as being like a painting; it can be in the room with you and you can ignore it, face away from it, but it still shapes the colour and mood of the room around you; or else you can stand before it and become absorbed. At the same time as being ambient, Drive By, and much of their other work, is also intensely physical, groove-based, rhythmic. Rob listened: Despite the flagrant rule-break, I loved this. It’s also the only time my wife has walked into one of our meetings to tell us how much she likes something she’s hearing through the door. It generated an interesting but ultimately possibly futile discussion about how we ‘use’ music, which Nick has outlined above. Futile, I reckon, as the fact is that we all just enjoyed the piece, both in its entirely and in the detail of the playing and the pleasure of its minute-by-minute unfolding. Tom Listened: I too thought this was a great listen, even exclaiming at one point (around the seven hour mark, or something) ‘this is brilliant!’. It must be to sustain interest with such subtle shifts between phases; very little changes from one minute to the next and then, all of a sudden, you realise that what you are listening to is completely different to what you were listening to five minutes beforehand. It’s a kind of uberwatchingthepaintdry alchemy that should be as boring as…my maths lessons…but somehow is a riveting, yet relaxing, listen. There is a problem though. I enthusiastically borrowed Nick’s CD after the meeting fully intending to listen to it lots. I have yet to find the right circumstances to put it on. With a hectic family life, lots of cycling/climbing/gardening, work, half hour long journey to work, ferrying the kids around etc etc, I literally haven’t yet found an hour (and 7 seconds) when I can sit down down and give this album a full spin. I don’t want to listen to half of it, so I do wonder whether it would get played much given my current life circumstances. In ten years time, when the kids are full time loiterers up the park and my body has fallen apart, I’ll probably own every album The Necks have ever made and listen to them regularly.